If it is possible for one’s PD cup to run over, mine is. In the past two weeks, I have been to two amazing conferences. First, NEAISL at the lovely Milton Academy for a one day, action packed conference. Just a few days later, I headed to Los Angeles for the annual AISL conference, where I found myself surrounded, once again, by world class librarians from across the US and Canada, visiting beautiful, innovative library spaces in and around LA. My next thousand blog posts could be reflections on the new ideas that I have come home with, consider yourself warned. What I thought I might attempt in this first reflection piece is to identify a common theme that ran through both conferences. It’s about access to information. NEAISL proved that our regional EBSCO rep has been very, very busy of late. Most of us are either-mid trial, in our first year or two with the product, and a few of us are well seasoned, early adopters of the technology. I don’t refer to EDS here in the ‘to have or not to have’ context, Alyssa did an excellent job in sharing the pros and cons of the program in an earlier post. I do want to share a catchy quote that I heard at NEAISL though. One librarian observed, “Our students don’t care which database their information came from. They only want to access the information quickly, to find valid results that are easy to cite, rich and varied enough to make their teacher happy, then they’re moving on.” Truth. So yes, I do like Discovery. That isn’t the point of this post, though. The point is ACCESS, with or without Discovery. Jenny Barrows of the Hopkins School said, “our students will never find our best materials if we have crappy records”. She and her colleagues believe that our shelves can practically sparkle with a quality, well honed collection, but the reality is that our students are still going through the computer to search for sources. Like all the time. They do not browse. They WILL NOT find our books if they are badly cataloged. She and her team of 3 began a descriptive catalog project, hoping to increase access points. Read all about it and learn the steps it takes to implement in your own library here. In essence, bad cataloging blocks our students’ access to information. This is going to take some time, but we need to be as diligent in weeding our records as we are in weeding our shelves. Welcome to Katie’s Summer Project Numero Uno. Good times! Speaking of cataloging/barriers to access, Liz Gray just shared this thought provoking article via Facebook. Do you check to make sure that your records are politically correct and not potentially offensive to your community? On a semi-related note, do you think about teenagers’ natural language searching or do you stick with standardized subject headings? How can we access that which we are not aware of? The next ‘access issue’ that I want to address is one that I thought long and hard about after attending what was easily one of the best conference sessions I have ever experienced. It was given by Nora Murphy of Flintridge Sacred Heart Academy, and is taken from an article that will soon be published in KQ…be on the lookout! Note: Nora is one of my new librarian sHeros. Check out her amazing library website. Nora did not present the material as an access-issue, per se. I’m taking liberties with that part, but just go with it for a moment. I think hope that it will make sense in the end. Nora began her presentation by showing us an image of a frog and an axolotl. 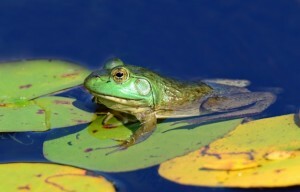 Frogs are the publications that we are familiar with–magazines, newspapers, scholarly journals, etc. (Note: not all of our kids know that these frogs are frogs.) 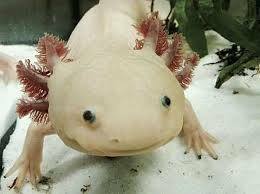 Axolotls are things that resemble frogs, but really aren’t–they could include trade journals, government documents, blogs, and social media. We as adults and professionals observe, categorize, ask questions. 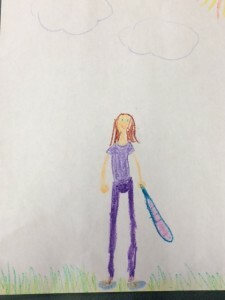 Our students aren’t typically this savvy (or simply have no exposure from which to draw). From the Virtual Library. Used with permission via Creative Commons Attribution-NonCommercial-ShareAlike 4.0 International License. Nora argues that we are missing a piece between location & selection of sources. <——-Source Literacy goes here. This gap gets in the way of research in a serious way. Source literacy requires knowledge of source types. What it is, where it exists, what it contains, who creates it, and why. Like anything we teach, we have to expose kids repeatedly to sources or they will forget. Nora suggests that we systematically create a bank of knowledge for them to draw on in the future. She is all about the Source Bank. 9th health class asks, “Why isn’t everything in the grocery store organic?”. What sources do you imagine will have relevant information on this topic? They think of some newspapers, a magazine or two, but really they don’t know much and aren’t able to predict what kinds of sources would have good information on farming, the food industry, or current trends. How do we expand their source literacy beyond basic, standard publications? Here’s another idea for a US History class. Convince their teachers that kids MUST know what an oral history is. It’s critical. Invite the teacher(s) to plan with you, to co-teach, co-assess—a unit, a year long goal, over next 3 years we will x, y, and z, whatever fits your school culture, but knowing that the repetition of a concept is what it takes to place it into long term memory. 9th Create assignment, what is an oral history? Characteristics? Do something with it. 10th grade: Studying the impact of religious, cultural, or racial persecution. Create a Digital Sourcebank. She likes Trello because it allows students to annotate (how they used a source, what they thought of it at the time, etc. Nora is piloting Trello with a few of her students. She showed us an example of a students’ work exploring the China/Tibet Relationship. The student had created columns in her source bank which included: Preliminary/Informal sources (idea generation), Core sources (print and digital), Necessary Bias—she needs to consider, but knows it represents a particular point of view (HOW GREAT IS THAT REALIZATION?! ), and finally, Visual Texts. Notice: the student is categorizing her own sources. The benefit of the source bank being formed early in the research process is that it allows for source assessment EARLY ON, not when the bibliography is turned in. There are so many wonderful, free resources out there, but if our students haven’t had exposure to a lot of different kinds of publications, frogs and axolotls alike, how can they possibly generate the kind of sophisticated, open source, research that could lead them to relevant results? If we do not make source knowledge a priority, then aren’t we ourselves, a sort of human barrier to our students’ access? I’ve hit you with a lot of information here. What are your thoughts? Please comment below. And please, if someone’s comment resonates with you, chime in! The more we can discuss, the better. Way back in the fall of 2014 when Independent Ideas was a newborn blog, my first post was Why I’m Drinking the “Google Drive” Kool Aid As I finish January “research season” with my freshmen and am full force into Sophomore World History projects, Google Drive has been on my mind. We’ve tweaked our use of Drive over the past two years. We’re now spending less time mandating that everything be done in the same (exacting) format, and instead are focusing on freeing ourselves up to answer individual questions as students work independently in class and at home. We’ve given each student a research partner who is his first responder for basic technology assistance and general questions. (This time of year we have a lot of students missing days for sports championships and Model Congress-type competitions, so partners were tasked primarily with keeping each other up-to-date and answering questions like, “Is there a rubric for the outline?”) Some students chose to share their project folders with their partner, and those who did so benefited from the extra set of eyes on their work. 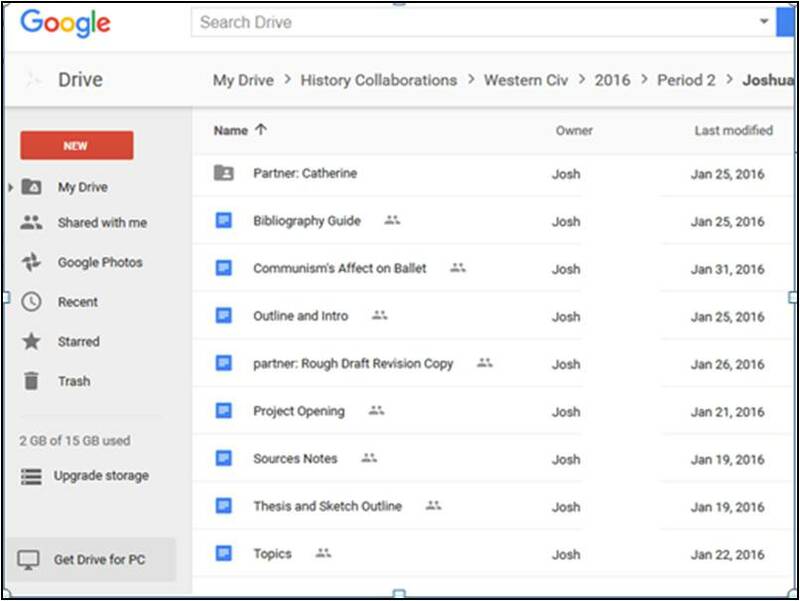 The Google Drive cloud-based platform has proven important not only for the ability to share work, but also for the ability to switch between devices. We’ve learned that the iPad is not the ideal (litotes, anyone?) device for writing a research paper with Chicago-style footnotes. Basically, beware, the mobile interface sometimes eats your footnotes. We have a class set of computers in the library, and students switch back and forth between PC and iPad depending on whether they are working on steps like note-taking and writing or steps like formatting footnoting and creating a bibliography. 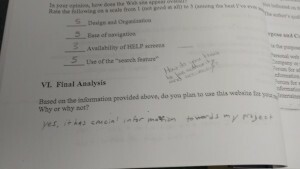 We want students to know that the format is standardized and is important, but we don’t want them spending time stressing about a hanging indent. With 80 9th graders this year and a month timeline for the freshman paper process, the teacher and I split up the classes in terms of commenting on individual assignments. We have a modified draft where we pick a few favorite topics (and a few students we specifically want to shepherd along), and then we each take the remainder of the students in two of the periods. Google Drive has shortkeys for commenting, and copy/paste has been my friend for many common concerns. We make sure to leave a trail so that we are supporting each other and providing the same feedback. We sometimes ask struggling students to respond so we know that they are reading our comments and making changes. 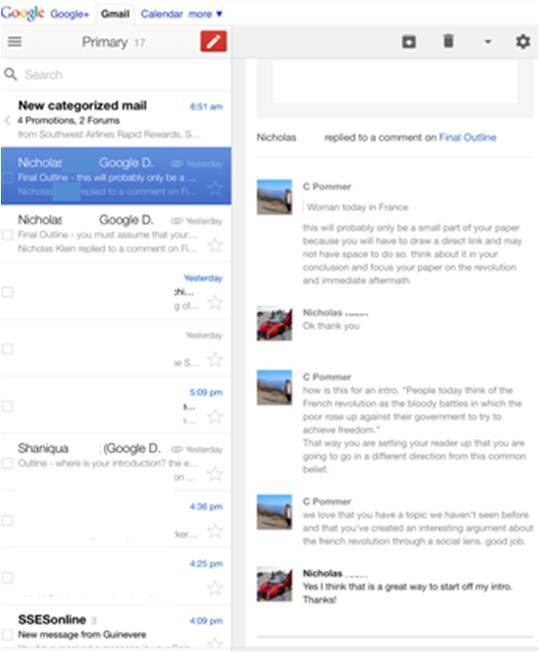 I have my account set up so that anytime a comment is added or someone responds to one of my comments, I receive an email. These link right back to the document and provide context. “Is this too vague?” now refers to a sentence and not to the paper as a whole. I feel like feedback is targeted. In this particular project, two of the top freshmen worked diligently on their papers on their own asking for feedback electronically on an almost daily basis. Their final papers were much better because we were able to give them the individual support that they craved as they reached sticking points in the process. The visibility and sharing are helpful for our internal coordination as well as for other supportive resources. As we plan our trip to the public library, we give the librarians at the Central Library viewing access to our topic/thesis/is this student on track spreadsheet that we update daily. They pull materials and run database searches on each subject. I can’t praise their reference department there too highly! Students working with tutors and with our Center for Academic Success staff share their folders so that the individuals working with them can use our comments to guide their work. 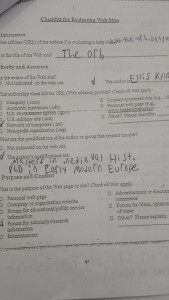 Students have been known to share their files with other History and English teachers, especially during the revision process. Another change over the last two years involves file types. On those occasions when I serendipitously come across the perfect article for a student’s research while working with another student, I’ll drop a file into her folder. These unpredictable surprises can’t help but lead to a little dopamine spike and maybe more time spent working on research. (On a related note, here’s how we talk about the compulsive desire for technology with our students.) We play around each year with requirements for notes, and for the past two years we stuck with this wording. 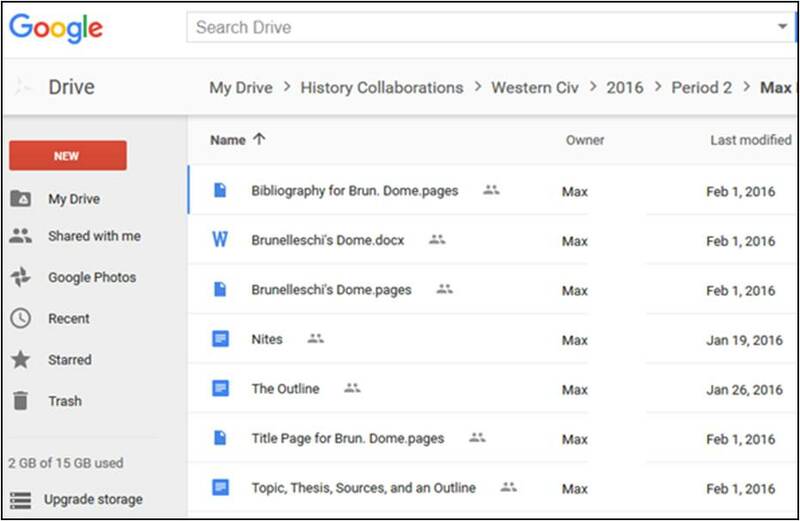 “We encourage you to take notes in Google Drive so we can see what you’re working on and accelerate you to the next step. However, if you’re someone who learns better with paper notes, listen up. At the end of each class period, take a picture of your notes from the day and upload them.” The vast majority take notes in Drive, though a few students in each class thank us profusely for letting them work with paper and pen. Moving beyond photos, let’s talk about extra credit. Almost every student will admit that teachers recommend that they should read their papers aloud to themselves as they revise. But they don’t. We’ve taken to offering one optional extra credit point to freshmen who record themselves reading the first three paragraphs of their essay and then record a 30-60 second reflection of the experience. They upload the audio to Google Drive, and we check that it’s complete. The feedback is pretty consistent. By now you’ve probably figured out our secret plan; the extra credit is just a gateway point to more time spent revising and a better final product. As this has been a relatively glowing review of Google Drive thus far, it’s time for the two caveats. Students are terrible at remembering to make their files Google Drive files and often upload Pages, Word, or pdf documents. This means that we can’t offer feedback, and we make them resubmit. These are often the same students who create files outside of the folders shared with us, who then wonder why we haven’t reviewed their work. I don’t know why these are the one sticking points, but it’s been consistent for a few students each year. We’re not paperless yet, but we’re closer. More importantly, for us it’s been a collaboration miracle, letting us work more efficiently as one unit. 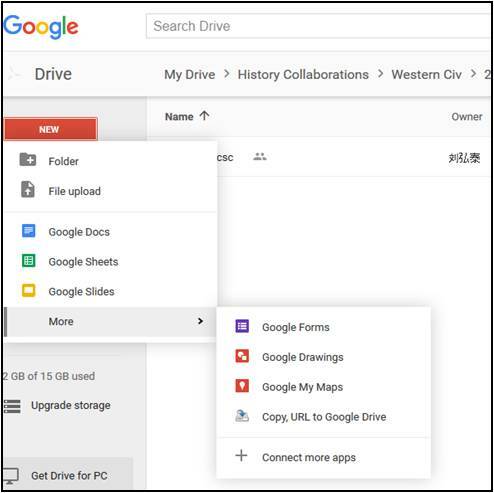 Any other thoughts on Google Drive? Suggestions for projects or collaborations, particularly for schools that are Google for Education schools? Each year, our 8th graders spend a week in Boston and are required to complete a month-long research project studying a topic that relates in some way to the trip. Because the librarian before me was incredibly organized, I have files for each project dating back to the early 2000s. 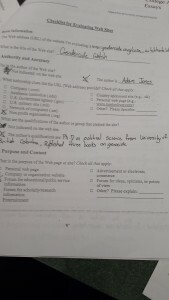 For years, the final product was a five-page historical report, with many intermediary steps such as 40 notecards, a page outline, and a full MLA bibliography. In recent years, however, the project has been amorphously shape-shifting, as we’ve experimented with modernizing the assessment. David Wee just shared his experiences with teaching note-taking in the 21st century, and I feel the need to do the same with research projects. This week has been a librarian’s dream….well, if you’re a librarian Energizer Bunny supplied with chocolate-covered espresso beans. Our 8th grade has four sections, and all week is collaborative interdisciplinary chaos. Students are being given two class periods in which to work with three educators —the History teacher, the English teacher, and me— on hand at all times to assist. As someone with a flexible schedule, it’s phenomenal to have the gift of time and the opportunity to work individually with students. How did depictions of the Battle of Bunker Hill differ from the American and British perspectives? What characteristics best describe the Sons of Liberty and how did they go about seeking change in the colonies? How did harnessing water power change the energy budget of Revolutionary times? How have the Boston Red Sox and Fenway Park played a role in Boston’s history and identity? How have burial traditions changed from Revolutionary times? These topics are more comparative and often ask the students to answer a how/why question without the stress of coming up with their own thesis statement. Middle school students benefit from learning what goes into analytical research questions so that they are more comfortable developing their own questions in future projects. Students are able to choose their own topics from a list of 75 instead of picking a topic randomly out of a paper bag. I consider this a huge win for the kids! There’s more buy-in from students who are invested in learning more about topics they’ve chosen themselves. By giving students 300 minutes of unstructured class time after returning from Boston, we’re helping them learn time management. We are able to monitor student progress on a minute-by-minute basis, eliminating the black box surrounding student work that’s sent home. I’m a fan of choice; however, there is one additional source that is a requirement for each student. Since we wanted the students to pay attention during the Boston trip and to take advantage of the expertise of docents at each site, they were required to submit three interview questions to their advisor ahead of time and to interview one expert while in Boston. This lets them practice speaking with an adult in a “professional” setting and gives them direct answers to their questions. I love it! I requested that we broaden the list of possible sources. Therefore, I want to say that giving students the latitude to choose the best sources for their individual topics has been an unmitigated success. It isn’t true. Some students are confused by the different choices and feel like they don’t know where to search for their topics. They turn exclusively to their trusty friend Google. On a case-by-case basis, this is easy to solve, but it doesn’t address the quiet students who want to remain under the radar. When should we be teaching students the best types of sources for individual projects, separate from evaluating sources of a particular type on a particular topic? Whenever you give students the latitude to work independently in a classroom setting, some use the time more wisely than others. For every student who diligently uses every minute, there is another who has gotten off track with cat videos. Then there are the aforementioned quiet students who assert “I have everything I need” whenever you stop by. However, my most urgent question is about the students who stick by the teacher needing constant approval without advancing independently. How do you balance your time with students during unstructured class time? Next up would be the iPads themselves. 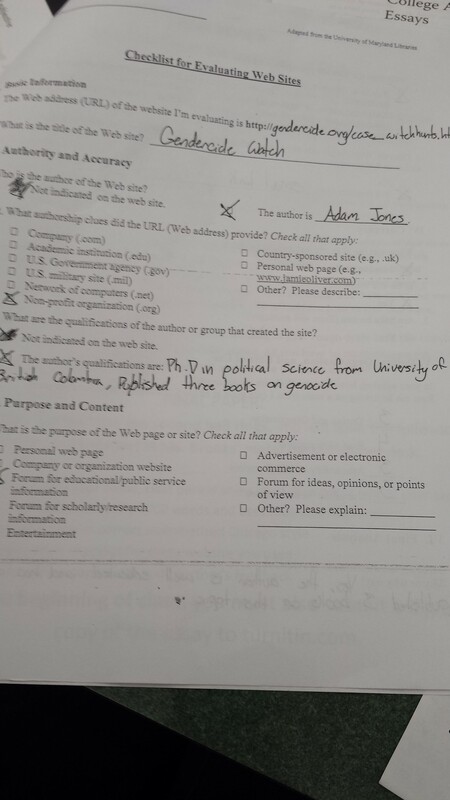 I have already spent 4 ½ periods today answering bibliography questions. Some of our digital natives don’t know how to italicize, double space, indent, or otherwise meet the requirements of MLA style. And the mobile versions of websites can hide the publication information that you need to cite a source correctly. Do you foresee a major change in specific formatting requirements in the coming years? The format of this project has shifted from a paper to a: “Product: The way you demonstrate your expertise is up to you. Product should involve creativity or analysis. How can you most effectively and engagingly show your findings? What skills do you have and how can you utilize them?” This comes shortly in the project description after the Product Objective, which I wholeheartedly support! “Use research to demonstrate expertise on your topic through analysis or creativity.” Again, I struggle with the balance between too much and too little freedom. Many students have chosen to write a five paragraph essay because it is a more familiar format to them. Others are designing posters or padlets. 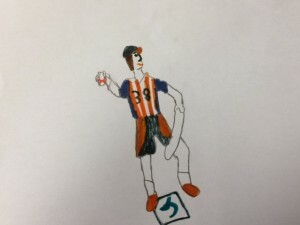 One girl is creating a comic book, and a few are writing a series of letters, such as between a mill girl and a miner and a doctor to his patients. I see some students spending more time on research and others on aesthetics. Some formats make it easier to demonstrate expertise in a subject. I also wonder how to keep grading fair across formats. Is a three minute video comparable to a five paragraph essay or a poster? And do we have teachers have the expertise in each format to gauge the quality of the student’s research as well as the quality of a particular format? Writing takes practice. And that practice must be supported with feedback and revisions. And that takes time. And students don’t necessarily enjoy it. And it can be time consuming for all involved. Does that mean that it isn’t worthwhile? I will be working with the English and History department chairs to determine the approximate number of pages that students have written historically compared with the current year. Our upper class teachers have expressed concern that our students’ writing is not as strong as it used to be. If this is a direct result of fewer writing assignments, is that something we need to address or should we focus more on assignments that demonstrate greater digital literacy? I have been working to align research expectations over the Middle and High school years. My ideal would include two research-based projects in each grade, one with a creative output and one with a written output. The projects could be split across disciplines and would give students the opportunity to practice the research process. We are getting there but aren’t there quite yet. Does anyone have a model they could share? Just like Dave’s note-taking conclusion, I have no one-size-fits-all solution. 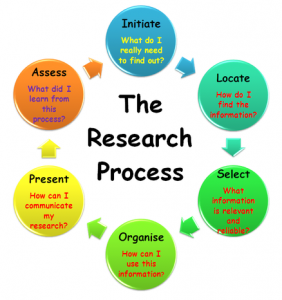 There is a team of smart dedicated teachers who want to teach the research process in an approachable and engaging way, and this iteration is a work in progress. As crocuses emerge from the frozen ground, I too reappear in mid-February after a month and a half of focused freshmen research. The freshmen research project is a keystone of 9th grade, the Western Civ teacher and I co-teach every day and every step, four classes a day Monday through Friday. The research is broken into daily tasks, and success in each task is valued as much as success in the final paper. We first spend a class searching for topics together and reflecting on what we find. We go over authority, accuracy, currency, bias, and coverage. 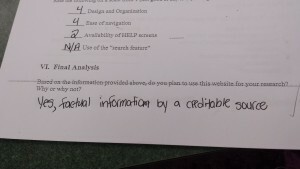 Students are taught to “think about clues that will let them know if a website is good to cite in an academic research paper.” We try to frame our discussion using that specific vocabulary and students get that different levels of evaluation are needed for different purposes. A pdf means it’s true. If it’s a soldier’s account, that means it’s unbiased because he was there. 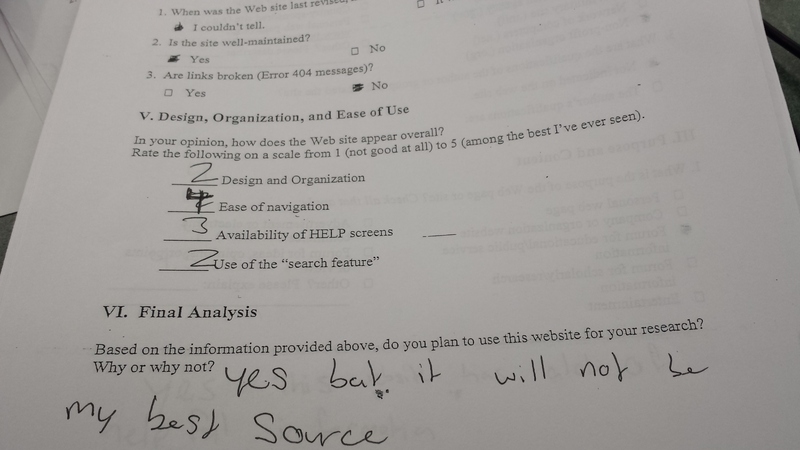 Thus, the web evaluation checklists. There’s no sugar-coating this. The kids hate the checklists. The only selling point is that their completion leads to a A on one of their daily assignments. However, the following year, when teachers are stricter about citing websites, students frequently return to the library to say that they are relieved that they know what they need to evaluate on the page before they begin to take notes. 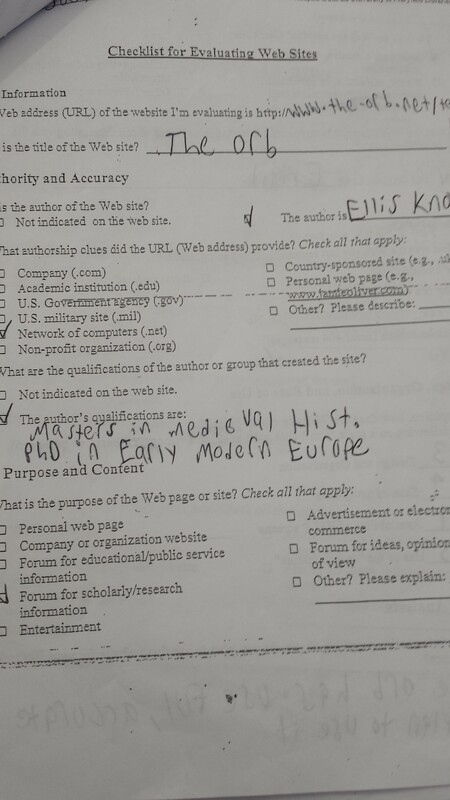 The sheet can be completed by a diligent student in about two minutes, it’s mainly checkmarks, and the format forces students to click out of their specific page. Sections include: authority and accuracy; purpose and content; currency; and design, organization, and ease of use. 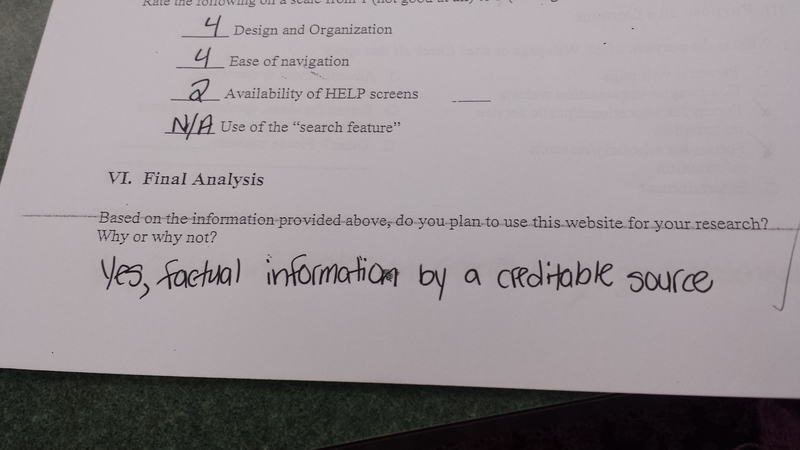 Students finish with a one-sentence analysis stating why they think the site is good for research. While it may seem surprising, we have purposely reverted to paper for the checklists. This serves three purposes. It keeps websites from being the easiest research option since they now involve an extra step that subscription databases do not. 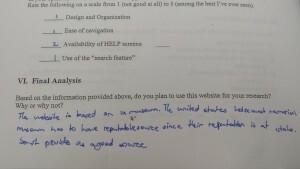 It also makes students consider the url and all relevant information because they have to rewrite it, which is more time intensive than copying and pasting. Finally, it gives us a visual for students who like to Google individually for each piece of information that they need. There are always a few students who search for single pieces of evidence, find one source for each, and ultimately end up with 15 sources for a 1700 word paper. When they hand in a stack of sheets, we have a conversation about actually saving time by finding three to five quality sources that will meet almost all of their information needs. 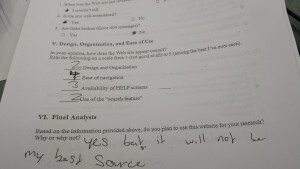 Reading student analysis of websites help me notice what students value most and what I need to address when teaching website evaluation. The most common weakness is found when I see this answer or one of its variants. Just because information is needed does not mean it is accurate or authoritative or credible. 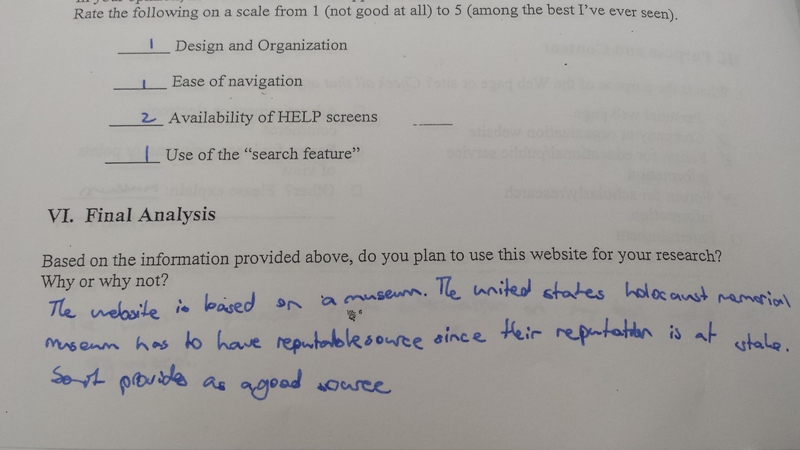 Sometimes, students are surprisingly honest in their answers as they reconcile their need for a particular piece of information and their distrust of a particular site. There’s a lot on the web, and the sites that often show up first on results pages are not always the ones that are best for research purposes. 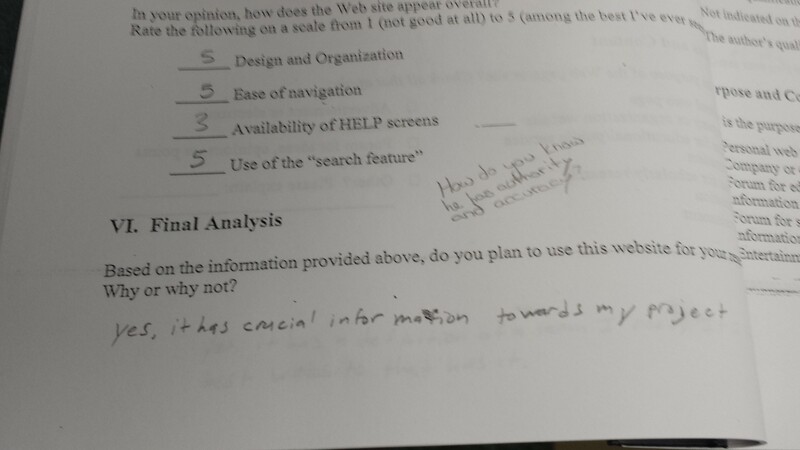 We teach better search strategies, and in grade 9, we also force web evaluation. It’s a strategy that meets our needs by requiring students to stop and reflect. It’s one part of our digital citizenship curriculum in middle and upper school. Now I’m curious to hear from you. What lessons have worked well in teaching students about using websites for academic purposes? How do you keep students from limiting themselves to the commercial sites that populate the first page of search results?